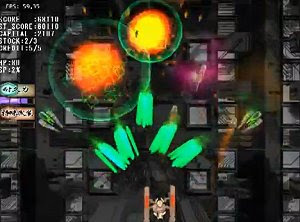 Denkou STG is a freeware vertical shooter from Japanese minds that spews laser beams to all sides. It’s a challenging shoot’em up with some really gray scenario, something that actually helps the player to track the colorful lasers and explosions. It’s a nice little game with different weapons and some boss fights that will please fans of the genre.